Twelve-year-old Derron James of Largo Heights and 11-year-old Glenroy Henry of Calder are the recipients of the newly established Gladys Priam Memorial Scholarships. 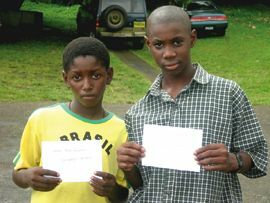 Young Derron, who was successful in this year’s Common Entrance Examinations, will be attending the Campden Park Secondary School in September, while Glenroy will be attending the St. Martin’s Secondary. Daughter of Mother Priam, Reverend Selina Joseph said the scholarship was a way of continuing her mother’s legacy. In a brief interview with SEARCHLIGHT, Joseph said that her mother was very dedicated to the work of the church. She also added that her mother always had a Sunday school and that she loved children very much. She said that this factor was one of the driving forces behind her decision to start the scholarship. Joseph further added that she sought assistance from pastors, and other close friends to identify children who needed assistance. The students will each receive the scholarships for one year during which they will be provided with the essentials for schools.